@ kyunagonzales@gmail.com for more details and to sign up! ​for the TNT Silent Auction. 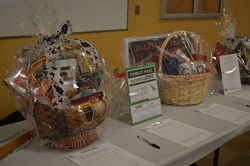 These amazing baskets are always the highlight of our silent auction! Please help your musician bring in something to donate towards their group's themed basket. If you don't have time to shop but would still like to donate, you may send in $5-$10 (in a labeled envelope) and we can do the shopping for you. Thank you! 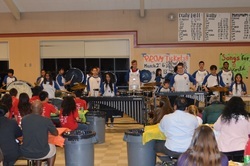 Beginning Band: "Fun in the Sun"
Dinner is being catered by On the Border. Menu includes your choice of 2 Pork Tamales or 2 Cheese Enchiladas or one of each, complete with beans, rice, chips, salsa, and a drink. Ticket order form is available for pre-orders (click here). Student performers will need to purchase tickets if they want to eat at the event. There is a "Performers Special" ticket available for a discounted price of $10 for the performers themselves. Ticket orders are due to Mr. Souliere on Friday, February 15th. (Checks can be made out to “PGH Band Boosters”) E-mail us at pghsbandboosters@gmail.com if you have questions. See a music student to purchase tickets too! Each year, we have a fabulous silent auction with themed baskets contributed by different sections in the PGHS and KAMS Bands. We also welcome donations by community members and businesses. (Download Donation Form Below) Contributions can be brought to the Band Room by February 15th so the boosters can assemble and wrap the baskets. Donations are Tax Deductible! Please contact kyunagonzales@gmail.com for more details and to sign up for more information. Credit cards are accepted.